Welcome to our Store page! 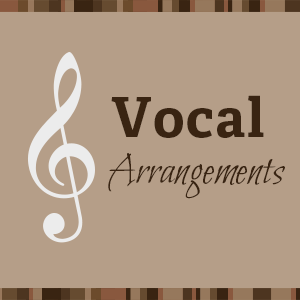 You can purchase numerous CDs and arrangements through our website. CDs available include the newest release New York Voices, Live with the WDR Big Band Cologne. 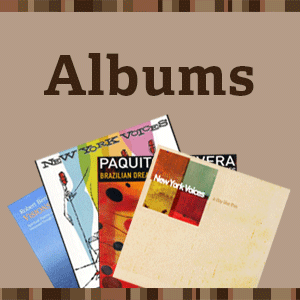 A number of our older CDs are out-of-print, but a couple of them are available on iTunes. Also, you can often find used copies on Amazon and Ebay. Many of our arrangements have been published by mainstream choral publishing companies, and there are also a number that are published by NYV. The self-published titles are sold at a set price for the arrangement, no matter the size of your ensemble. These charts are emailed in PDF form, and include all rhythm section parts (where applicable), and a letter-of-permission agreement. In the case of the rest of the published arrangements, we have provided links to the various publisher websites. These arrangements are sold on a per-copy basis, as is traditional in choral publishing. In all cases, you will find detailed information about each arrangement, and full audio clips. In addition to the charts listed on our website, there are a number of early NYV arrangements available through UNC JazzPress. Also, if you are looking for any Darmon Meader arrangements that were not written for NYV, you can find additional arrangements at darmonmeader.com. Payment instructions: You can pay via PayPal, credit card, or check. If paying by check, make payable to New York Voices, and mail to: New York Voices, 14 Colgate Road, Maplewood, NJ 07040. Your order will be processed once payment has been received.